Introduction: An epiphrenic esophageal diverticulum is a consequence of severe long-standing achalasia and can further exacerbate the symptoms of achalasia. 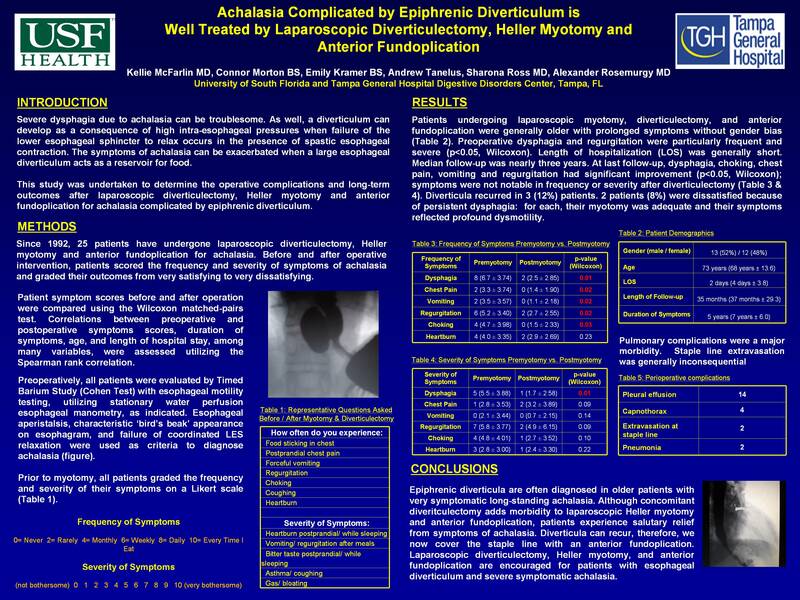 This study was undertaken to determine the operative complications and long-term outcomes after laparoscopic diverticulectomy, Heller myotomy, and anterior fundoplication for achalasia complicated by epiphrenic diverticulum. Methods: Of 440 laparoscopic Heller myotomies, 25 patients have undergone laparoscopic diverticulectomy, Heller myotomy, and anterior fundoplication. Before and after operative intervention, patients scored the frequency/severity of symptoms utilizing a Likert scale (0=never/not bothersome to 10=always/very bothersome). Data are reported as median (mean +/-SD).